In the mountain town of Taxco in Mexico’s state of Guerrero, large-scale mining can be dated to the sixteenth century, and silver is a way of life. In the years following the Mexican Revolution (1910–20), jewelry and other silver objects were crafted there with an entirely innovative approach, informed by modernism and the creation of a new Mexican national identity. Antonio Pineda was a member of the Taxco School and is recognized as a world-class designer. He lived a long and creative life, passing away at the age of 90 on December 14, 2009. Nearly two hundred examples of Pineda’s acclaimed silver work were displayed in Silver Seduction: The Art of Mexican Modernist Antonio Pineda, a traveling exhibition opening at the Museum of International Folk Art June 6, 2010 through January 2, 2011. From its inception, the Taxco movement broke new ground in technical achievement and design. While American- born, Taxco-based designer William Spratling has been credited with spearheading the contemporary Taxco silver movement, it was a group of talented Mexican designers who went on to establish independent workshops and develop the distinctive “Taxco School.” Pineda, internationally renown for his silver work identified himself primarily as a taxqueño, or Taxco, silversmith. These designers incorporated numerous aesthetic orientations—Pre-Columbian art, silverwork, religious images, and other artwork from the Mexican Colonial period, and local popular arts—merging them within the broad spectrum of modernism. 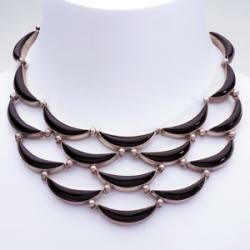 Pineda himself is lauded for his bold designs and ingenious use of gemstones. Silver Seduction traced the evolution of his work from the 1930s–70s, and included more than a hundred necklaces and bracelets, as well as numerous rings, earrings, and diverse examples of his hollowware and tableware. All of the works feature Pineda’s hard-to-achieve combination of highly refined execution and hand-wrought appeal. 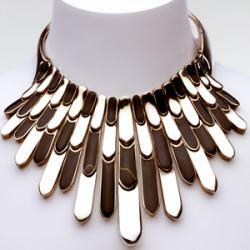 Pineda’s jewelry is especially known for its elegant acknowledgment of the human form. It is often said that a Pineda fits the body perfectly, that it feels right when it is worn. 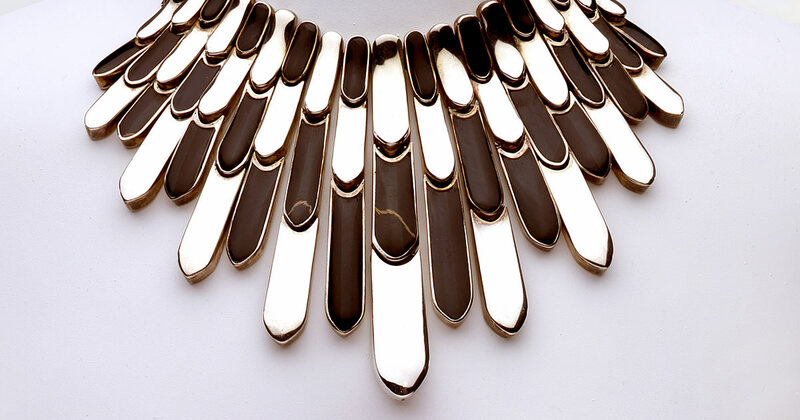 For example, a thick geometric necklace that might at first glance seem too weighty or rigid to wear comfortably is, in fact, faceted, hinged, or hollowed in such a way that it gracefully encircles the neck or drapes seductively down the décolletage. In addition, no other taxqueño jeweler used as many costly semiprecious stones or set them with as much ingenuity, skill, and variety as did Pineda. Only the most talented of silversmiths could master the unique challenges posed by setting gemstones in silver at the high temperature necessary to work the metal. Pineda, however, managed to set gems with as little metal touching them as possible, giving them a free or floating look while still holding them firmly in place. In Pineda’s hands, some stones were embedded; rows of gems were set close together to emphasize the structural lines of a design; or stones were cut to fit irregular shapes in a design. Pineda often used cultured pearls, large amethyst drops, and onyx in his designs, many examples of which are on display in the exhibition. The remarkable creativity of this “Silver Renaissance” era represents a unique moment in the design of Mexican jewelry. 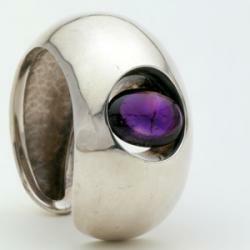 Pineda’s and his colleagues’ modernist works lives on today in Taxco with a thriving industry in silver smithing. Silver Seduction: The Art of Mexican Modernist Antonio Pineda and its publication are made possible through the generosity of the Donald B. Cordry Memorial Fund and Jill and Barry Kitnick. The exhibition was developed by the curatorial team of the Fowler Museum with consulting curator Gobi Stromberg. All works presented are either from the collections of Cindy Tietze and Stuart Hodosh or the Fowler Museum at UCLA. Exhibition images may be found at http://media.museumofnewmexico.org/.